BLACKFIRE Interior Protectant is the only product you need to maintain the look and feel of leather and soft vinyl upholstery. This 100% water based protectant uses micro-engineered polymers that are readily accepted by leather and soft vinyl. BLACKFIRE Interior Protectant contains no oils, silicones, or petroleum distillates. It leaves a deep, satin, natural-looking finish on interior auto surfaces. This unique protectant is perfectly pH-balanced (7) to match the pH requirements of leather. After treatment, a micro-fine moisture barrier remains on the surface to resist perspiration stains and help retard UV-induced fading. BLACKFIRE Interior Protectant can be used on all interior surfaces, including leather wrapped door panels and leather seats! 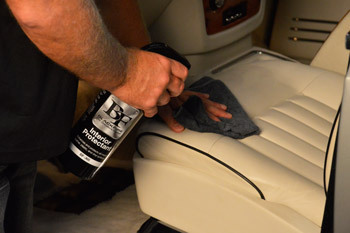 BLACKFIRE Interior Protectant enhances and protects vinyl and moisturizes and protects leather. It functions as a leather conditioner, a vinyl protectant, and a multi-surface interior protectant! Use Interior Protectant to enhance and protect interior wood accent strips, polished and satin metals, plastic panels and cup holders. What makes all of this possible is a newly developed, state-of-the-art polymer that protects, moisturizes, and softens with a natural pH that is perfect for leather. This new polymer has been chemically micro-engineered to perform both the function of a protectant and the function of a moisturizing lotion. It was crafted for the skin care industry but we found the characteristics of this new polymer perfect for a multi-material interior protectant. This unique formula is boosted with Polycharger to enhance its durability and protective properties. BLACKFIRE Interior Protectant dries quickly to a non-greasy, satin finish that does not attract dust! It is perfect for today's new interior materials. Many new automotive leathers are topped with a clear vinyl layer for protection. Owners can mistakenly treat these "leathers" with a leather conditioner which results in a greasy film because the oils are unable to penetrate the vinyl topping. BLACKFIRE Interior Protectant is perfect for both naturally faced and vinyl faced leathers. The satin finish will not create dash glare and complements the matte vinyl now used on most dashboards. Spray BLACKFIRE Interior Protectant directly on the surface or spray a microfiber applicator pad and wipe areas to avoid overspray on glass. On leather, allow a minute or two for product to penetrate. Wipe surface with a clean Cobra Microfiber Towel. If overspray lands on glass, it can be wiped off easily with any glass cleaner. BLACKFIRE Interior Protectant dries very quickly allowing you to drive the vehicle immediately without fear of staining clothing.